Yiwu is the hometown of sweet osmanthus, First class flower; sweet osmanthus is one of the ten biggest precious flowers in China. In the Spring, the pavilion bund China rose with its flowers blooming. Yiwu, elusive rusticity and optimal moisture, is rich of scented camphor trees. The ancient camphor trees are elegant in groups; thousands of leaf layers, falling their shade everywhere. At the cusp of spring and summer，the green small flowers split the full branches. The light breeze delivers the fragrance and gladdens the heart. That tranquilness, that warmth and that smooth have sublimated this gentle cultural old city. That intensity, that fearless and that share thrive have revealed this fast moving cultural old city as well. Yiwu is located in the central area of Zhejiang province with a total land area of 1,105 square kilometers. The whole city governs 7 subdistricts and 6 towns, has a population of 670 thousand registered as local domiciliary and 1.2 million as external temporary. Yiwu has a long history. It was in the 25th of Ying Zheng of Qin Dynasty (B.C. 222), was in Wushang County, in the 7th of Wu De of Tang Dynasty (A.D. 624), and was changed as Yiwu, in 1986, when it was established as a City. From old times, Yiwu has gained the honor of being the Home of: Culture, Luo Binwang – one of the Four Outstanding Persons in Early Tang Dynasty, Zong Ze – the famous Anti-Jin General of Song Dynasty, and Zhu Danxi – one of the four famous doctors of Jin and Yuan Dynasty. In modern times, Yiwu has produced educationist Chen Wangdao, literature theorist Feng Xuefeng and historian Wu Han, among others. Since the reform and opening policy, Yiwu has resolved to execute the development strategy of Building the City by Prospering Commerce unswervingly, using the commodity industry as a leader to drive regional economy, and become a large market city and strong economy city from a traditional agricultural small county. In 2006, the whole city realized a domestic gross value of production of RMB35.2 billion Yuan and a total financial revenue of RMB4.4 billon Yuan. Financial institutions have outstanding of deposits of RMB72 billion Yuan, and farmers average net incomes of RMB8810 Yuan. In 2007, the Yiwu general economic index was 8th of all counties (cities) of the whole country. Furthermore, in recent years, Yiwu has been listed as one of the counties (cities) of leading the modernization in Zhejiang, one of the key regions of boosting urbanization in Zhejiang, and one of the first groups of strong counties (cities) of the expanding economic management authority. Currently, Yiwu is one of the regions with the most development active in Zhejiang. Even in the whole country, Yiwu have successively gained such honors as being the National Technical Project Advanced City, National Sports Work Advanced City, National Culture Work Advanced City, Zhejiang Civilized City, Zhejiang Educational Strong City, etc.. Furthermore, it has been awarded the National Double Support Model Cities Award four consecutive times. Today, Yiwu appears a prosperous scene with a flourishing market, developing economy and steady society. The commodity industry has been leading industry in the regional economy.The market of Yiwu is in fact composed of a succession of several markets spread over the city. There are about twenty markets, some of which are gathered in the same building. 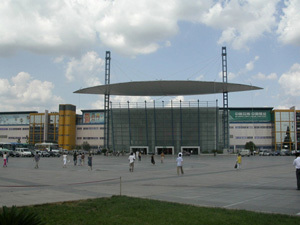 Today, the different markets of Yiwu cover an area of around 2.6 million square meters, with more than 420,000 items classified in 1900 different categories,and had export to more than 212 countries and regions… thus Yiwu is the biggest supermarket in the world, but also the most important exhibition centre for small commodities. As a result, every day, more than 2000 containers leave Yiwu. This makes Yiwu an obliged way in the international trade landscape. Furthermore, the Yiwu market has been an international commodity distribution center and the important base for foreign merchants to purchase commodity. The industrial economy is rapidly aggregating and strengthening, and currently has developed and is exploiting industrial park areas of 64 square kilometers, with more than 1300 enterprises. It has also cultivated a group of predominant industries, scale enterprises and famous products of socks, ornaments, zippers, cosmetics, shirts, cultural articles, pen-making, toys, etc, formed industrial developing structure of small commodity, large industry, small enterprise, and large colonization. Efficient agriculture steadily develops, and traditional agriculture is rapidly shifting to modern agriculture, city agriculture and external agriculture. City construction changes quickly, and a large group of provincial and civil key projects such as Xiuhu Square, Meihu Exhibition & Sports Center and Yiwu section of Hangzhou-Jinhua-Quzhou and　Ningbo-Jinhua freeway are being built up. The area of the city built-up district has expanded to 62 square kilometers, the city population has increases to 2,200,000, and the culture level reached above 75%. Thus, the city’s integrations rapidly advanced. After carrying out village satiation cleanness, road hardness, road lighting, family beautifying and environment optimization construction, the city outlook has changed quickly. Socialism politics and spiritual civilization are constantly strengthened. Social careers are increasing, while the economic environment is persistently optimized. People’s standards of living are improving day by day. In the 21 century, Yiwu develops with the times, exploits and innovates, puts forward the aim of walking in giant steps, and strives to become in the top 10 of world commodity fairs in the next 20 years and construct a truly international commodity city. Greatly push economical internationalization, constantly improve economical general force and international competitive power. Insist on an international strategic guiding direction, fully improve economical whole quality, and gradually construct Yiwu into an international commodity circulation center, manufacturing center, R&D center and shopping center. Also, to modify and perfect general planning of International Commodity City of 32.4 square kilometers, quicken the second period project and the International Trade Center of International Commodity City, cultivate and strengthen exhibition industry with Yiwu Fair as a world leader, and make the Yiwu Fair into an international famous exhibition. Furthermore, carry out five-action simultaneous development strategy of foreign trade drawing, trade and industry linkage, famous brand driving, mass impelling, government motivating, endeavor to make Yiwu marketinto International Commodity Circulation Center with the lowest cost, best credit and best service, actively carry out trade and industry linkage, take industrial construction as carrier, fostering special industry and scale enterprise, let informatization dive industrialization, industrialization boost informatization, walk new industrialization road, make the brand of commodity, made in Yiwu famous in the whole world, build up Yiwu into an international commodity manufacturing base. Greatly advance technical innovation, actively construct technical innovation service system, bring the construction of Digital Yiwu into effect, and construct the International Commodity R & D Center. Adhere to the integration of introducing and walking out, regard commodity foreign trade as breach, take foreign investment use as key, and speed up the rapid development of the external economy. Greatly develop modern service industry with shopping and tourism as an emphasis, strive to create global biggest supermarket and construct an International Shopping paradise. Vigorously boost city modernization, and constantly promote international levels of city functionality. Vigorously advance rural urbanization, constantly improve civil modern level Surrounding the aim of constructing International Commodity City, divide Yiwu into four sections of main city section, subsidiary section, suburb section and border section, through integration system, resources concordance, system innovation and base co-construction, plan urban and rural social economical development, adapt the working method to local conditions, advance rural urbanization in multiple sections and steps, and strive to make Yiwu realize all urban and rural integration within 20 years. Intensify integrated planning concepts of the civil region, accelerate to notify and make out layout program of the whole city and community, and plan traffic, water supply and sewage to cover the whole city. According to the requirement of adjusting measures to local conditions and guidance to different types of areas, boost all region and village reconstruction, gradually make existing villages under construction into communities with basic infrastructures, and complete all projects with the aim of creating good rurality and good environments. The City holds to the concept of “Golden Yiwu” blasting off among the blue mountains and green waters. This includes adapting to the requirements of city modernization, internationalization and automobiles, scientifically design city general plans, be quick to notify and draw up respectively 100 square kilometers plan of the central region, Yidong North and Yixi South, form developing situation of “one body, two wings, three hundred”, strengthen subarea plan, control detailed regulation and regimentation work of various special plan, and perfect plan system. Insist on constructing city with high quality, quicken old city reconstruction and infrastructure construction such as International Logistics Center, International Airport etc, endeavor to create national park city and environmental protection model city, and build green Yiwu. This year, with investment of RMB19 billion Yuan and 73 items of new and continuous building key projects, in five years, finish old area reconstruction, and newly develop and build residential district of 4 million sq.m. Insist on effectively managing city, with the aim of struggling to create national sanitary city and civilized city, and construct park city with people as the base and the harmonious coexistence of people and nature as the foundation. Persist in managing city with high level, determine the concept of managing city, and advance market progression of city resources. Vigorously push scientific leadership, and constantly improve the ability of leading modern construction. Adapt to the demand of rural urbanization, quicken the work of village removal and building community of the whole city, fully push the innovation of the domiciliary registration system, practise management system of community residents’ committee, continue to carry out and strengthen rural strategy with business, optimize agriculture structure, develop urban agriculture, boost agricultural industrialization, hasten agriculture to shift to enterprise, constantly expand employment space, unitedly plan the work of urban and rural employment and social security, and advance farmers to shift to citizens. Greatly boost social civilization, constantly improve people’s general quality of life.